Acrylic is a versatile substrate; it can be used indoors as well as outdoors. It can easily be routed into custom shapes to fit into any frame or concept. The graphic must be vinyl mounted due to the substrate’s properties. It performs well in backlit situations when paired with white ink. Use acrylic when you want to produce a high-end display or when backlighting is needed. High level of impact resistance (17 times the impact resistance of glass). Greater resistance than polycarbonate against scratching. Greater UV resistance than polycarbonate. Can be polished smooth if necessary. Greater clarity, clarity can be restored through polishing. click here for info where to buy Dilantin usa Technical Specs: Type: Clear, Non-Glare, White; Size: 48″ x 96″, 60″ x 120″(please call for availability); Thickness: Clear: 1/16″, 3/16″, 1/8″, 1/4″, 1/2″, 1″; Non-Glare: 1/16″, 1/8″, 1/4″; White: 3/16″, 1/8″, 1/4″ 1/2″. Applications: Architectural, Interior Design, Fine Art Reproduction, Outdoor Signage, POP/POS, Theme Park, Exhibit & Displays. Products: Home & Office Decor, Illuminated, Sign Faces, Awards, Office & Retail Signage, Promotional Displays, Wall Graphics, Theme Park Signage, Museums, POP/POS, Acrylic, Desktop. Aluminum is mainly used when an outdoor long term use product is needed. It is able to be routed and bent into custom shapes and can be ordered in custom sizes. When paired with our powder coating, it has outdoor durability up to 5 years outdoors. Technical Specs: Size: 48″ x 96″, 24″ x 18″(available only in 024), Custom sizes and shapes are available; Thickness: 040, 060, 080, 1/8″, 024(available only in 24″ x 18″ blanks). Applications: Architectural, Interior Design, Outdoor Signage, Theme Park, Exhibit & Displays, Storefront Signage, Municipal Signage. 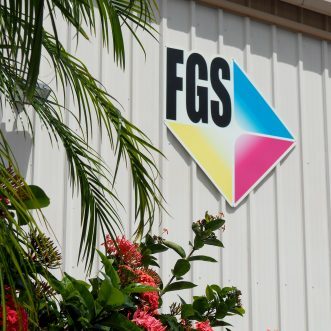 Products: Powder Coat Signs, Wall Graphics, Dimensional Signs. Aluminum Composite is a lightweight rigid substrate that is intended for long-term outdoor use. It is composed of two sheets of aluminum sandwiching a polyethylene core, making it light enough to hang safely and provide durability. 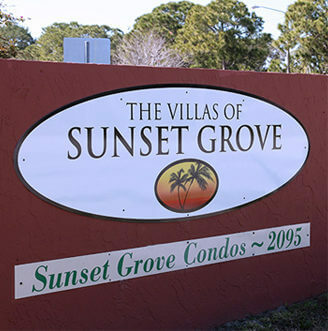 Its properties make it perfect for wayfinding signs and areas that experience heavy traffic. When paired with our powder coating, it has outdoor durability up to 5 years. 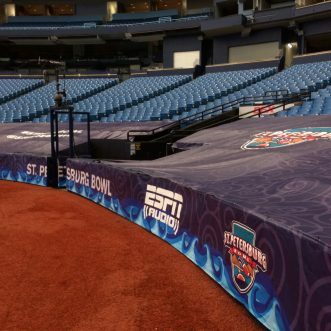 Technical Specs: Type: Alumacore, Aluminum Composite, Diebond® available upon request; Size: 48″ x 96″, 60″ x 120″(call for availability); Thickness: 1/2″, 1/4″, 1/8″, 3/16″. Applications: Architectural, Interior Design, Outdoor Signage, POP/POS, Theme Park, Exhibit & Displays, Storefront Signage. Products: Dimensional Signs, Construction Site Signs. Corrugated Plastic is used for single use to short-term applications. It can be routed into custom shapes to meet your needs. 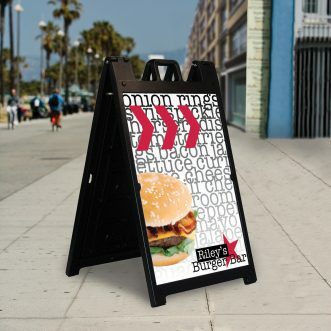 It is typically direct printed and can be used with sidewalk signs or stepstakes for road side applications. Technical Specs: Readily available: White; Call for availability: Black, Yellow, Blue, Green, Natural, Granby Blue, JM Gray, Brown, Ivory, Orange, Red, Navy, Silver, Purple; Size: 48″ x 96″, 60″ x 120″(call for availability); Thickness: Readily available: 1/8″ (3 mil); Call for availability: 1/4″ (6 mil), 1/2″ (10 mil). Products: Sidewalk Signs, Standees, Golf Tournament Signs, Political Signs, and Real Estate Signage. Foamboard is used when a rigid light weight substrate is needed. It is perfect for creating standees when paired with an easel or similar hardware. It is also easily wall mountable with the use of french cleats or a double-sided adhesive. It can be either direct printed or vinyl mounted depending on the use and the mounting location of the product. 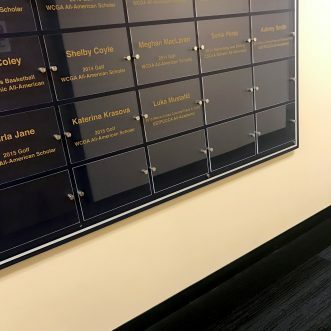 It can be routed into custom shapes and is available in different thicknesses. 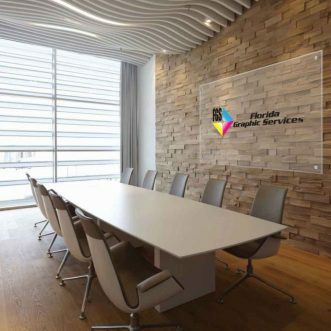 Technical Specs: Type: Gatorboard, Ultraboard, Foamboard; Color: White, black; Size: 48″ x 96″, 60″ x 120″(please call for availability); Thickness: Call for availability:1/2″, 3/16″, 3/4″. Applications: Interior Design, Fine Art Reproduction, POP/POS, Exhibit & Displays. Products: Posters, Standees, Dimensional Signs. Polycarbonate, also know as Lexan, is similar to acrylic with one exception it is able to be direct printed. Polycarbonate is used when the final product is going into a frame or when polished edges is not needed. 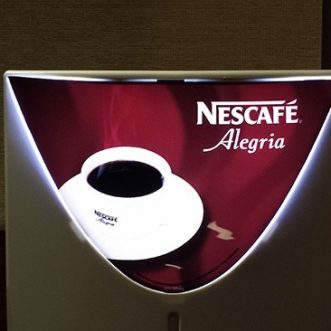 It is an ideal substrate for backlit signs because of its impact resistant properties. When paired with white ink and it can be routed into custom shapes to fit your application. Higher level of impact resistance (250 times the impact resistance of glass). Less rigidity than acrylic and can be bought in flexible grades. Can handle temperatures up to 240 degrees Fahrenheit. Highly restraint to adds and other chemicals such as gasoline. Can be drilled without worry of cracking. Technical Specs: Type: Standard, Non-glare, White(Milk); Size: 48″ x 96″, 60″ x 120″(please call for availability); Thickness: 010, 020, 1/16″, 1/8″, 3/16″, 1/4″, 1/2″. Applications: Architectural, Interior Design, Fine Art Reproduction, POP/POS, Theme Park, Exhibit & Displays. Products: Home & Office Decor, Illuminated, Sign Faces, Awards, Office & Retail Signage, Promotional Displays, Wall Graphics, Theme Park Signage, Museums, POP/POS, Acrylic, Desktop, Dimensional Signs. PVC is a durable and versatile substrate. Perfect for direct printing and routing into custom shapes. It performs well outdoors when paired with liquid lamination. It is available in different thicknesses and colors. Technical Specs: Color: White and Black readily available, all other colors must be special ordered; Size: 48″ x 96″, 60″ x 120″(call for availability); Thickness: 1/8″, 1/4″, 1/2″ readily available, all other thicknesses must be special ordered. Applications: Architectural, Outdoor Signage, POP/POS, Event Signage, Theme Park, Exhibit & Displays, Storefront Signage. Products: Sidewalk Signs, Hanging Exhibit Graphics, Golf Tournament Signs, Political Signs, Dimensional Signs, Construction Site Signs. 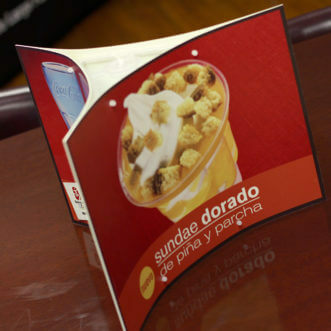 High Impact PolyStyrene is a thin, smooth, hard plastic sheet that is commonly used in POP displays because of its ability to bend, flex, and be shaped. It’s lightweight and available in a slightly translucent form as well as true dead-white for opaque double-sided prints. 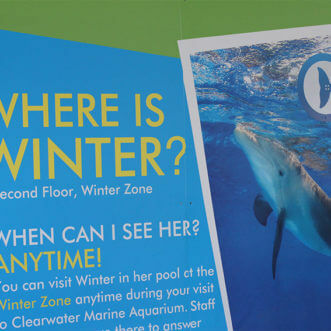 Styrene has water-resistant characteristics making it a great alternative to paper and cardboard signage when short-term outdoor durability is needed. Technical Specs: Size: 48″ x 96″; Type: White, Dead White; Thickness: 010, 015, 020, 030, 040, 060, 080. Applications: POP/POS, Theme Park, Exhibit & Displays, Storefront Signage. 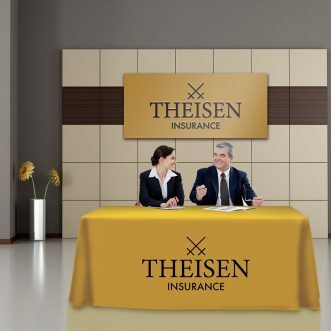 Products: Backlit Signs, Wall Graphics, Pop Up Displays. We have a diverse adhesive vinyl selection. Whether it be long term or short term, indoor or outdoor, cut vinyl or printed vinyl; we have a solution for any requirement or specification. Techical Specs: Size: 54″ max width; Type: Clear, Greyback, White; Variation: Permanent, Removable. Applications: Architectural, Interior Design, Outdoor Signage, Fine Art Reproduction, POP/POS, Vehicle Graphics, Event Signage, Theme Park, Exhibit & Displays, Storefront Signage. Products: Backlit Signs, Wall Graphics, Decals. We have the experience and equipment necessary to make your backlit prints pop! Technical Specs: Size: 54″ max width; Type: Polyester, Luminousity; Thickness: 010, 7 mil. Applications: Interior Design, POP/POS, Exhibit & Displays, Storefront Signage, Backlit Beverage Dispensers, Drive Thru Signs, Menu Boards and Directional Signage. Technical Specs: Size: 120″ max width. Color-rich high-resolution prints are a result of dye, converted to gas, during the heat transfer process. The tones then blend into each other creating a photographic quality, unparalleled by any other printing method. 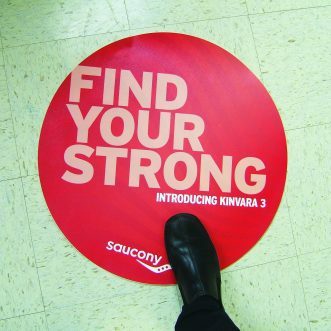 Create on-demand, high impact, POP, tradeshow, and interior soft signage. We have a wide selection of fabrics to suit your every need. We can print using dye sublimation, latex, or UV direct print onto our fabrics depending on your specifications. Technical Specs: Size: Widths vary depending on material; Type: Blockout, Heavy Knit, Polyduck, Power Stretch, Removable Adhesive Fabric, Satin, Spandex, Tri Poplin, Triple White, Waterfall. Applications: Architectural, Interior Design, Outdoor Signage, Fine Art Reproduction, POP/POS, Theme Park, Exhibit & Displays, Storefront Signage. Products: Backlit Signs, Banners, Flags, Retractable Banners, Tradeshow Flags, Hanging Exhibit Graphics, Heat Transfer Graphics, Pop Up Tents. Now Available in 10 Foot Widths. Heavy duty paper prints that can be framed, folded and laminated. 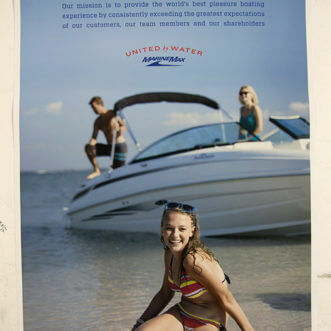 We can print up to 62″ wide by any length. We specialize in over size posters. Paper is good for short-term indoor applications. The finished product is normally laminated to protect the print, but with our new latex printer, this is not necessary. Technical Specs: Width: 54″, 60″(call for availability); Thickness: 8 mil; Weight: 200 g/m^2. Applications: Interior Design, Fine Art Reproduction, POP/POS, Event Signage, Exhibit & Displays, Storefront Signage. 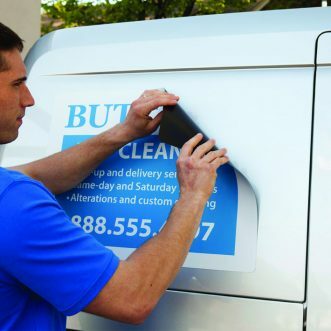 We have a vinyl for every need to make your jobs pop! 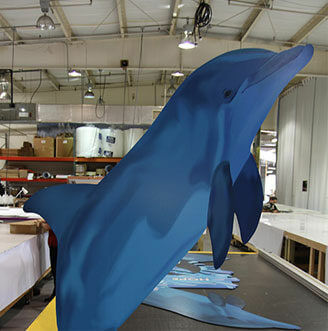 Reflective, metallics, wrap materials, concrete film, floor graphics, translucent, static vinyl and more. Technical specs: Size: Width varies depending on material; Type: 3M 180c Controltac, 3M 8264 Scotchcal, 50/50 Window Perf, 6 mil Permanent, 6 mil Removable, 70/30 Window Perf, Brushed Chrome Vinyl, Clear Static, Commercial Grade Reflective Vinyl, Engineering Grade Reflective Vinyl, GF High-Tack Vinyl, GF Wrap Material, Oracal 3751, Oracal 3951, Oracal Low Tack Wall Vinyl, Permanent Clear Cast Vinyl, Polypropylene 13 mil, Polypropylene 7 mil, Translucent Vinyl, White static, Window Film; Don’t see what you need here? Let us know and we find it. Products: Backlit Signs, Wall Graphics, Decals, Floor Graphics. 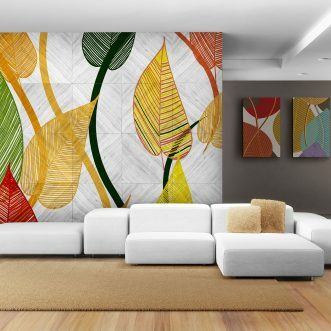 Brighten up a room with digitally printed wallpaper. Cover your wall with customized designs that represent you, your company or your brand. Our custom wallpaper is printed on vinyl or canvas and are washable and fade resistant. The images we print are a durable as those on traditional wallpapers. Our standard material has a suede-like texture that is rich and appealing. We also offer a smooth wallpaper that is ideal for fine art reproductions. Technical Specs: Size: 54″ wide. Applications: Architectural, Interior Design, Outdoor Signage, Fine Art Reproduction, POP/POS, Theme Park, Exhibit & Displays. Products: Wall Graphics, Murals, Home and Office Decor, Displays, Child Bedroom, Art, and Backdrops. 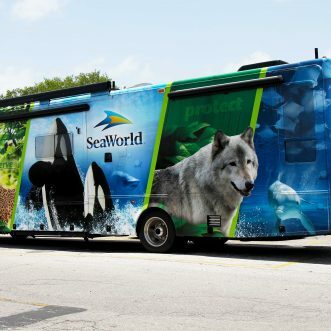 Turn your vehicle into a moving billboard, reaching hundreds of potential clients daily. 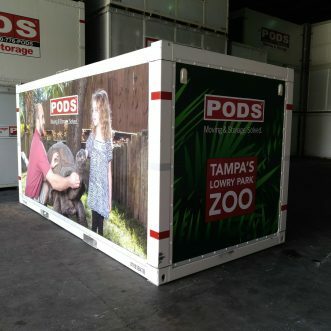 We have wrap material for any situation, whether it be a flat box truck or a curvy exotic sports car, we have you covered.